Beriev A-50U airborne early warning and control (AEW&C) aircraft is a modernised version of the A-50 AEW&C aircraft. The fourth A-50U AEW&C aircraft was delivered to the Russian Air Force in March 2017. Image courtesy of Alan Wilson. Beriev A-50U AEW&C aircraft is equipped with Shmel II radio technical complex from Vega Radio Engineering. Image courtesy of Alan Wilson. 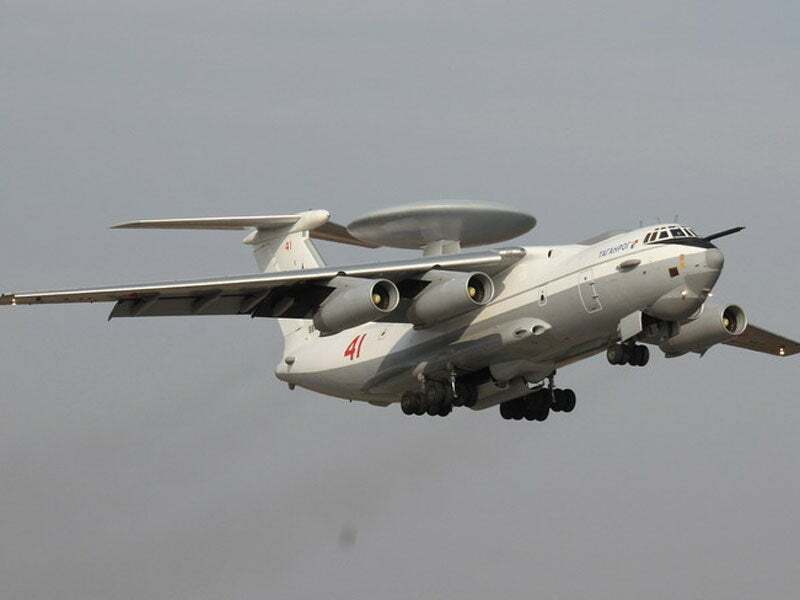 The A-50U airborne early warning and control (AEW&C) aircraft is an upgraded version of the A-50 AEW&C aircraft. It was developed by PJSC ‘Beriev Aircraft’ in collaboration with Vega Radio Engineering Corporation, for the Russian Air Force. The A-50U can be deployed in a range of missions, including detection, tracking and identification friend or foe (IFF) determination of aerial and land-based targets. It also provides surveillance, command, control and communications for commands posts of automatic control systems. The aircraft can also be used to guide fighters towards their targets and conduct counter-attacks on hostile forces. The A-50U upgrade programme was announced in 1995 and the first airframe entered the test phase in 2008. The upgrade works of the aircraft are being carried out at Beriev Aircraft’s facility in Taganrog in the Rostov Region, Russia. The Russian Air Force received the first A-50U aircraft in October 2011, while the second and third aircraft were delivered by March 2014. The fourth aircraft was handed over to the Russian Ministry of Defence in March this year. The upgrade of onboard AEW&C systems significantly reduced the overall weight of the mission complex, enabling the aircraft to carry additional fuel for increased range. The landing and take-off performance, as well as stability and control of the platform remain unaltered. The flight and navigation suite aboard the aircraft integrates satellite navigation system for high-navigational accuracy during operations. Additionally, the new aircraft offers high comfort for occupants as it also incorporates rest rooms and a snack bar with household equipment. The aircraft is manned by a flight crew of five and ten AEW&C system operators and specialists. The A-50U AEW&C aircraft has a length of 46.5m, wing span of 50.5m, height of 14.7m and wing area of 300m². The A-50U is equipped with the Shmel II radio technical complex (RTC), which offers advanced capabilities for detecting low-contrast land-based targets. The complex offers a radio range of 2,000km in high-frequency (HF) band and 400km in ultra-high frequency (UHF) band. The Shmel II system can track 300 targets at a time and direct interceptors against 40 targets. "The A-50U can be deployed in a range of missions, including detection, tracking and identification friend or foe (IFF) determination of aerial and land-based targets." The upgraded RTC includes a radar system, digital computer complex, IFF, command, control and guidance system, and radio communication systems. It uses new computational tools and improved algorithms for the operation of the complex. The introduction of digital signal processing further reduces the weight and size characteristics of the RTC hardware. The advanced radio systems aboard the aircraft use modern methods of installation and assembly for reduced power consumption, size and weight of the equipment, as well as increased reliability. The operator consoles of the new aircraft also feature large, high-resolution liquid crystal displays (LCDs) replacing the cathode ray tube (CRT) displays aboard the A-50 AEW&C aircraft. The A-50U also features a self-defence system containing active and passive electronic countermeasures and radar reflectors. The self-defence system protects the aircraft from incoming guided and unguided missiles. The A-50U aircraft is powered by four Soloviev D-30KP turbofan engines. The power-plant allows the aircraft to fly at a maximum speed of 800km/h and attain a maximum range of up to 9,000km. The aircraft has a maximum take-off weight (MTOW) of 190t and maximum flight endurance of approximately 11 hours. SCOTTY Group provides solutions and manufactures systems for beyond line-of-sight surveillance and communications.